The display element AS-D16-24-V24 is used as affordable display and operating element for facilities and devices. It is integrated and controlled via a serial interface. 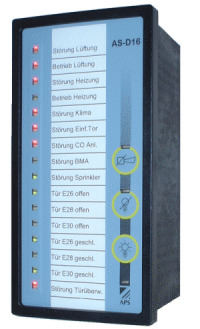 The AS-D16 features 16 DUO-LED, three operating buttons and a buzzer. It is installed into the cabinet or device front face. Easy labelling enabled by the enclosed slid-in strip. Interface and supply lines are connected to the screw terminals on the device backside. 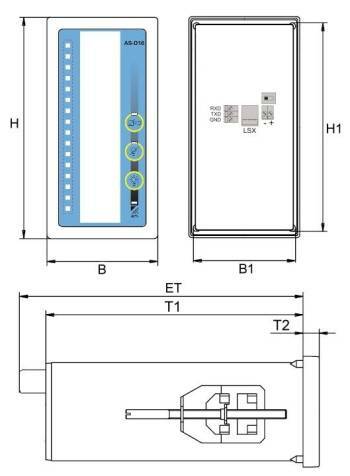 The AS-D16-24-V24 may also be used as detached display of the fault reporting system LSX. It is directly connected to the LSX-CM via a cable. 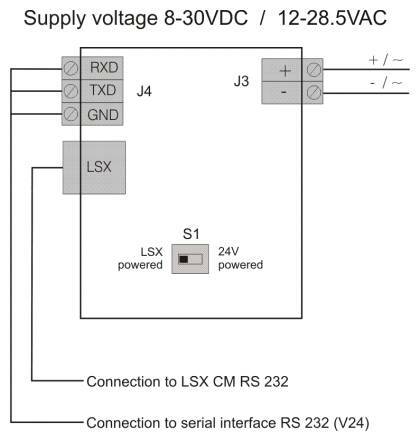 In this case, the power supply comes directly from the LSX. The switch S1 is therefore switched to position "LSX powered". All data are transmitted line by line as readable commands. Each message corresponds to one line which must be concluded with ASCII 10 (Newline, '\n'). All data are transmitted as ASCII characters. Binary values are coded in hexa-decimal. Boolean data will result in a check for > ASCII '0'. The display is organised into 5 columns (bytes) of 8 LEDs (bits). 5 byte-values are needed to set all columns. 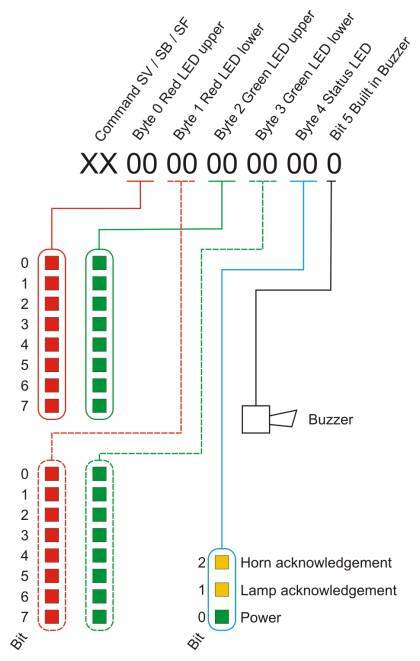 The installed buzzer is controlled separately by Boolean value. C1 "Byte 0 Red LED top"
C0 "Byte 1 Red LED bottom"
00 "Byte 2 Green LED top"
F4 "Byte 3 Green LED bottom"